An act of kindness can go a long way. 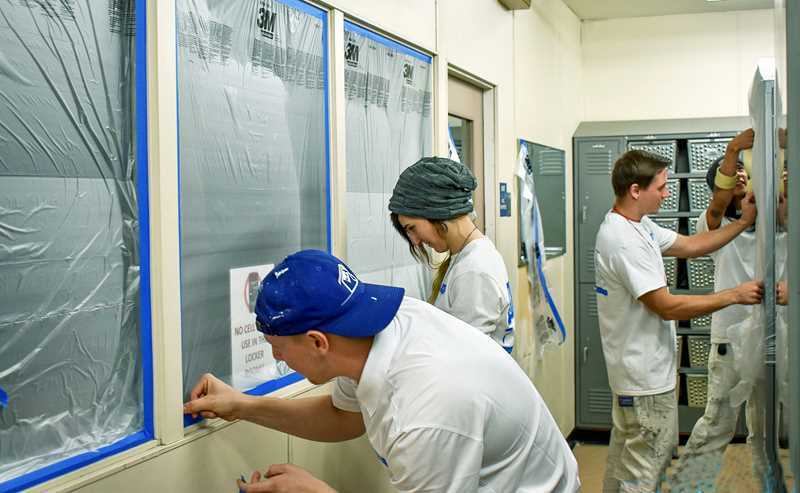 For Newberg High School, a re-painted and touched-up girls locker room was much needed and Newberg-based JK Paint & Contracting found a way to help. Late last month, Joe Kelly and his team of painters arrived at the high school while students were on a short holiday break and spruced up the space for free — a job that would have cost upward of $3,500 had it been contracted to a customer. "We knew we wanted to take some time during this slower season to do something for the community," Kelly said. "We just had our eyes open for an opportunity for that and we found out that they needed some help at Newberg High School." Kelly said that his business tries to find ways to give back to the community wherever it can, especially because of how successful it has been over the past few years. Doing this project for the high school was a no-brainer and the improvements made by the painting and chip repair are evident. On the business side, the company is doing well, Kelly said. "This year has definitely been a growth year," he said. "It's been a good year, we've learned a lot and I'm super lucky to work with the folks that I do. They're honest and extremely reliable." Before the job was done, scratches and peeling paint scarred the old doors in the NHS girls locker room; the walls were covered in paint splotches that thinly veiled the wear and tear of the past few decades. Chips and stains were all over the place. It was — like many locker rooms in older high schools — not an aesthetically pleasing environment. That was where Kelly and his company came in. Before the project got started, NHS put up a poll on Instagram for students to decide which color they wanted; they decided on a blue-green shade that serves as a calming backdrop. Kelly said the feedback from students has been positive so far and that they seem glad to have an improved facility in terms of aesthetics and cleanliness. For Kelly, doing this kind of work is rewarding. He looks forward to doing this kind of thing again in the future, free of charge, for a school or local business. "I enjoy it a lot and I can't wait to do another one," he said. "Newberg has been really good to me and I've really enjoyed working here. The people are great."